Print the RPM² Measurement Chart. Pull out your current manufacturers insole from your running shoe. While standing on your insert, feel where the middle of the First Metatarsal is located (see illustration below). 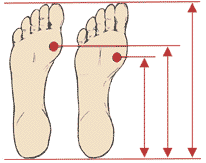 Use the RPM² Insole Measurement Chart to measure the insole from heel to where you measured the middle of First Metatarsal. Measure in cm; if the cm is between ½ sizes round up to the nearest ½ size; e.g. 18.25 would then be 18.5. Using a ruler measure in cm from your heel to the end of your big toe. Please measure both your left and right foot. This illustration shows two feet which are the same length, but each require different size inserts. There are different fittings for short-toed feet and long-toed feet. Proper insert-fitting incorporates arch length (heel-to-ball measurement) in addition to heel-to-toe length. Correct fitting properly positions the ball joint directly over the RPM2 sensors for most accurate running and cycling power.